Despite the bitter weather, a hundred people attended the talk on February 12th given by Michael Lowe, Wootton's own lute-maker and historian of the instrument.. 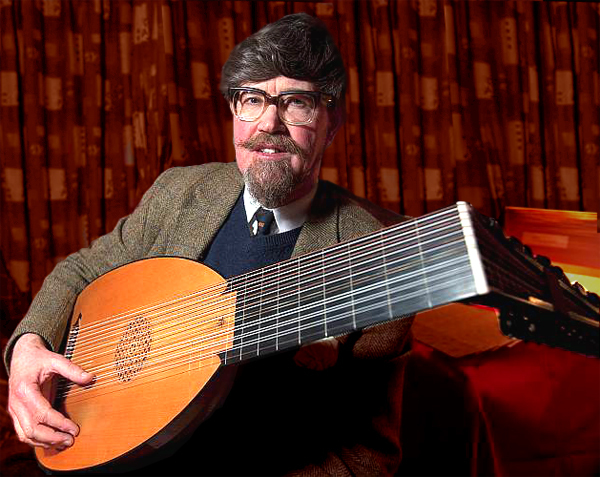 Some had come along after watching an item on the local BBC TV that evening, which featured Michael talking about the lute's renewed popularity. Over a captivating hour, Michael explored the evolution of the lute and its place in society over several centuries, focusing on different styles of design, as well as the techniques of playing the instrument. He also examined the emergence of similar instruments around the world and how the Moorish influence had spread from North Africa to Europe. Michael illustrated the role of the lute through paintings, showing it in courtly surrounds as well as in a more humble locations, such as inns. Ultimately, it was the rise of the orchestra, with many instruments contributuing to one piece of music, which led to the slow demise of the lute. Many people were fascinated with the display of materials and tools which he had brought along to show how these delicate instruments are constructed. So far, he has made 159 in a career spanning 35 years, and his current waiting-list is still well over ten years. Michael's talk raised £649, giving a total of £7,602 after fourteen talks. For me, after listening to Michael's commitment and enthusiasm, the lute has certainly risen quite a few notches. In a world that values loudness and “hype”, the lute is gentle and soothing, lending itself to the intimate “soiree” rather than the mammoth concert. We were reminded that the lute has often been referred to scornfully as “a plucked instrument”. Thanks to Michael, we can now see it as something to be listened to and enjoyed, a therapeutic gift, and a reminder of the value and continuity of good music - Rev. Stephen Jones, Wootton.